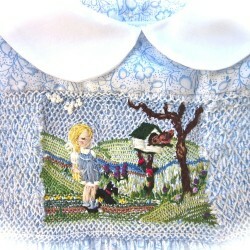 This 100% cotton size 4 dress is a one-of-a-kind, heirloom piece of work in which I have incorporated both hand smocking and hand embroidery to create a scene, or “picture” on the bodice of the dress. 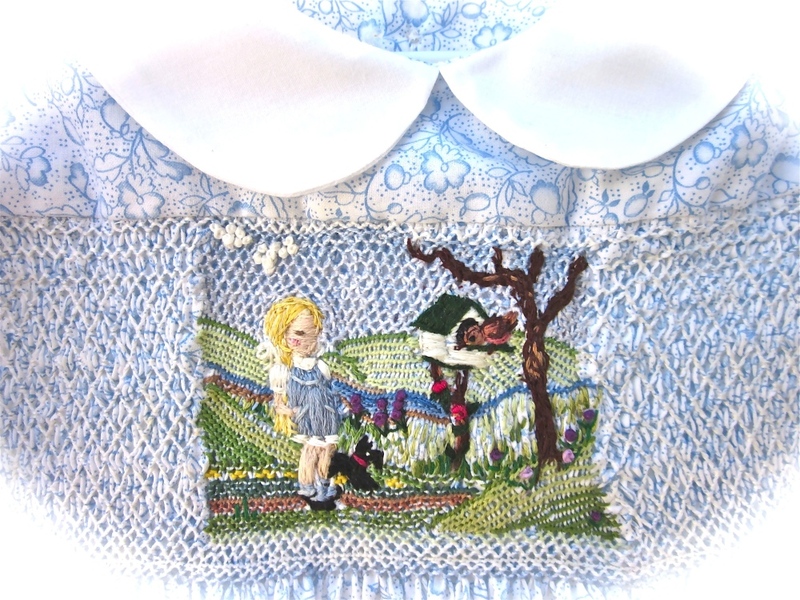 Creating and doing the artwork on the dress bodice satisfies my artistic need to express myself. 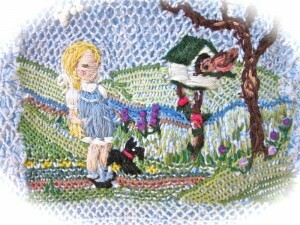 I consider each dress front to be my “canvas,” and all of the wonderful colors of embroidery floss to be my “paint”. 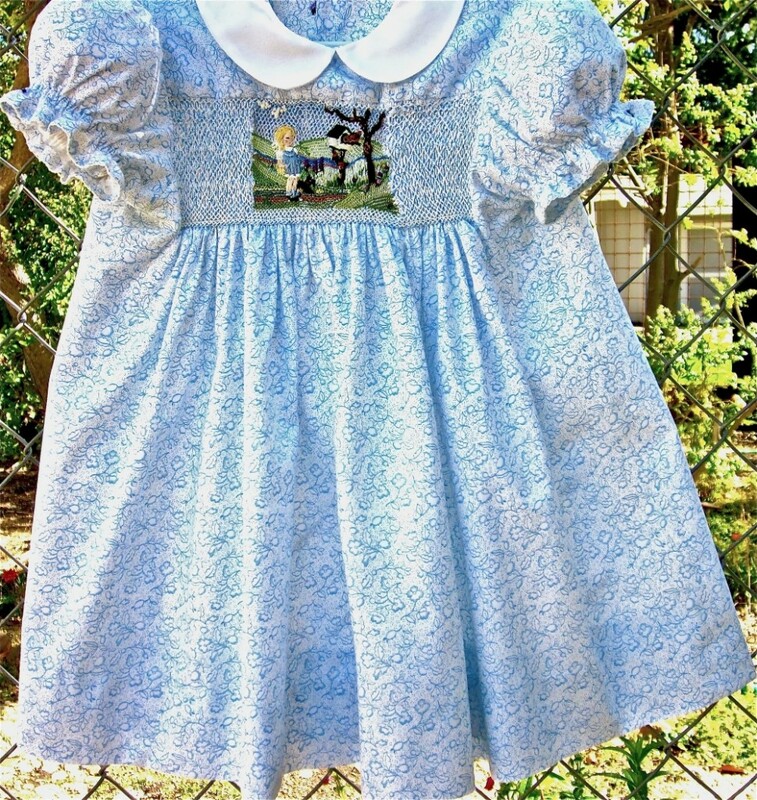 Tagged as bird, childrens clothing, flowers, girls dress size 4, hand embreoidered, hand smocked, heirloom quality, puppy dog, rabbitwhiskers.com, Spring, toddler, unique, wearable art. 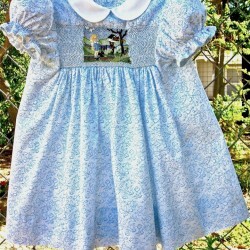 I’ve designed and made this one-of-a-kind, size 4, cotton dress.Using my own technique of combining hand-smocking and hand-embroidery I’ve created the design and the artistic country scene on the dress front. For me, the creation of each dress is a work of art. 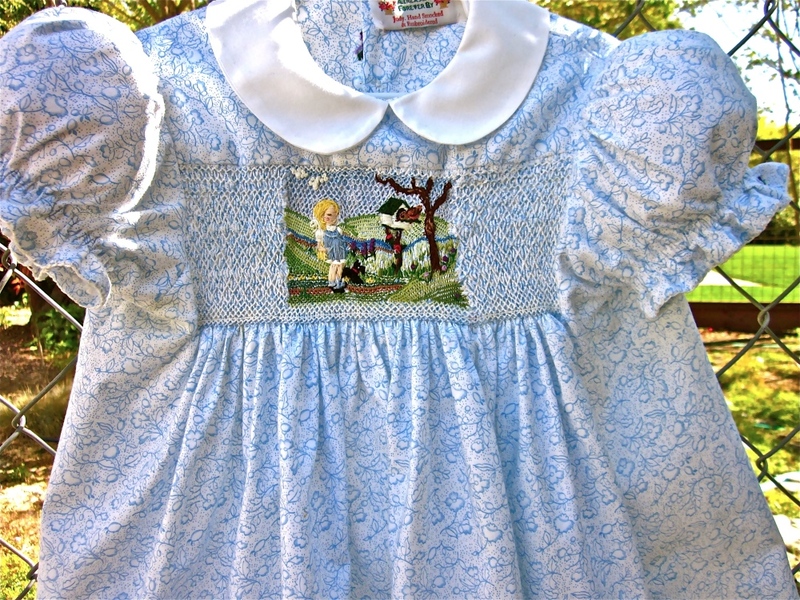 I consider a dress front my “canvas,” and the wonderful colors of embroidery floss, enable me to “paint” whatever I’d like to see on the front of a little girl’s dress. 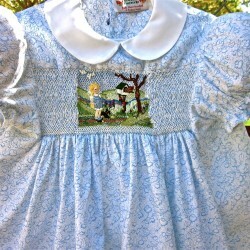 This dress is smocked entirely in a design of white thread with one row of light-blue as an accent. The country scene centered in the smocking is quite detailed, the space being entirely filled in stitches, both embroidered and smocked. 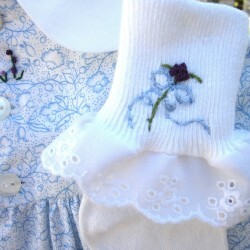 The sleeves are hand-trimmed in a white blanket stitch and each has two flower buds embroidered on the ruffle. 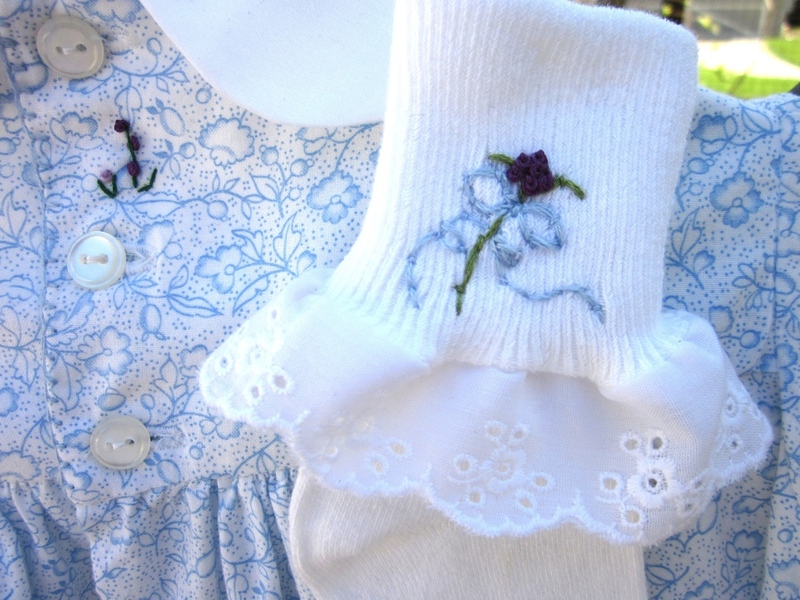 The back button placket is hand trimmed in light-blue blanket stitch and two small flowers are embroidered between the first and second button. 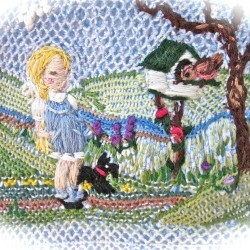 a pup & her girl, meet a bird along the way. **Measures approx. 21″ from back of neck to bottom of hem. *If ordered from outside the U.S. please convo me to make shipping and fee arrangements.